A bright new star was sizzling on the Bollywood scene, promising to make the decade full of excitement and delight for movie-goers. 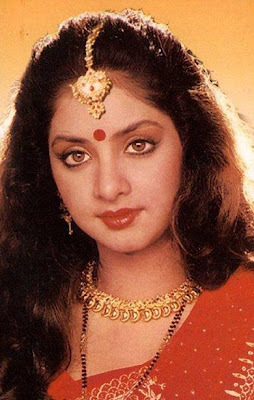 Her name was Divya Bharti. The starlet sparkled everywhere she went. Her infectious laughter lit up rooms and her mischievous grin dazzled the hearts of love-struck boys around the country. But the gorgeous teenager would never make it to 20. Born in 1974 to middle-class parents, Divya was a happy child. It was rare to see the chubby little girl without a big smile on her face. Her perfect doll-like features startled strangers wherever she went. Her parents were constantly asked if she was real. When she was in her first year of high school, however, Divya grew restless and unhappy. She struggled miserably in academics, failing most of her classes.Watching her classmates easily surpass her in subjects like math and science was a blow to her self-esteem. But one day, just like in a movie, she was randomly approached by a film producer who was enchanted with her cherub features. He wanted Divya to star in his next picture! Bursting with excitement, Divya immediately quit school and enrolled in dancing, singing, and acting classes. There, she found her element. The bright-eyed teenager thrived in the environment, where suddenly she was good at everything! But her lust for life got in the way. Like any other teenage girl during the late 1980s, she enjoyed spending too much time with friends and unfortunately, that angered the producer. After the two had a horrible fight, he replaced her in the film with another young actress. Divya was devastated. She was pursued two more times by film producers, but had similar results. Both roles went to other actresses. Depressed, Divya grew disinterested with the film industry and shelved her dream of becoming a star. To lift her spirits, her mom took her on vacation to Kashmir. Their vacation, however, was cut short. Film producer D Ramanaidu had come to Mumbai seeking an actress for his latest film. He was curious about Divya and wanted to audition the young beauty for a role. Charmed by her innocence during their interview, the producer cast her in what would become the Teluga hit Bobbili Raja (1990). In 1992, she eventually moved on to Hindi cinema with a notable role in the thriller Vishwatma. Practically overnight, Divya became the hottest new celebrity in India, making more than a dozen movies in one year. Despite her star status, she was still just a kid. Much to the chagrin of producers, she delightfully pulled pranks on her co-stars and playfully danced around the sets. When she was 18, the young beauty fell in love with film producer Sajid Nadiadwala and the two soon married. It was a fateful afternoon in 1993, when the newlywed learned her costume designer, Neeta, wanted to discuss dresses for her upcoming film. Divya agreed to meet Neeta and her husband at her apartment. Neeta claims when she and her husband arrived at the apartment, Divya was already drunk and was in the midst of making another drink. The two were in the living room when they saw the tipsy actress attempting to sit on the window ledge. Before they could run to her, she had already lost her balance. She died from the five-story fall. Her death created a media circus, with the entire country crying out for answers. Did she accidentally fall? Did she commit suicide? Was she pushed? Police were equally baffled, because people present at the scene, plus Divya's own husband and relatives who weren't even there, offered choppy statements, even awkwardly changing their stories at different points. It definitely raised eyebrows and caused an even bigger uproar in the media. Fingers were pointed at her husband, who had been rumored to be tied to the mafia. Did someone want Divya out of the way? Did she know too much? Conspiracy theorists pointed out that the window she fell from sits above a balcony. If Divya had merely fallen, they said, she would have fallen straight down into the balcony. But the fact that she fell at a wide angle, to avoid the balcony, and crashed to the ground doesn't make any sense. It had to be the result of someone pushing her out the window. Police investigated the death for years, until in 2003, they finally gave up and called the case closed, stating the death was accidental due to lack of evidence. But to this day, thousands of people believe otherwise. Leaving it one of the most unsettling mysteries in Indian history.